This stunning property on the beautiful island of Rhodes has beautifully appointed suites, some with private pools. Located at the idyllic beach of Lardos at the south-eastern tip of the island of Rhodes and just a stone’s throw away from the picturesque village of Lindos, Lindian Village is set amidst 60 acres of lush Mediterranean flowers and trees, small rivers and lakes on its own private beach, with spectacular views of the crystal clear Mediterranean. Ideal for discerning travellers who seek a relaxing holiday in an unpretentious environment with personalised service. Enter into a Greek village, designed with classical, simple, yet elegant architecture, paying tribute to tradition in its most modern interpretation. A stylish escape to the south. Stylish double rooms in green and white hues, with every modern amenity, comfortable and intimate, equipped with cosy balconies. They are located in the main village where the blue of the sea blends harmoniously with the whitewashed houses, bounded by shocking pink bougainvillaea and lush floral gardens. Located on the 1st Floor above the River Passage Private Pool Suites. Decorated in pastel hues with relaxing lavender colours these Suites open onto private terraces with outdoor jacuzzis and sun lounges with a panoramic view to the Zen flowing Rivers Isle water flow. Undoubtedly its highlight is the private jacuzzi. 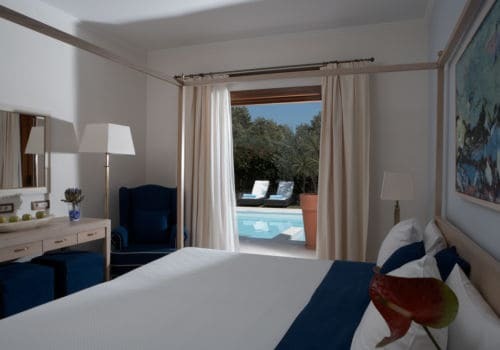 Dressed in deep blues and stunning whites, these suites are especially designed for complete privacy in absolute style. With oversized four-poster beds, original works of art, elegant touches, these suites are set amidst their own lush garden with a private swimming pool and sun decks guaranteeing seclusion and total luxury for those who seek the ultimate romantic escape. River Passage Pool Suites can accommodate up to two adults and two children. Featuring a private swimming pool in its own secret gardens. This suite can accommodate up to two people and can be interconnected with the Ottoman Gardens Junior Suites. 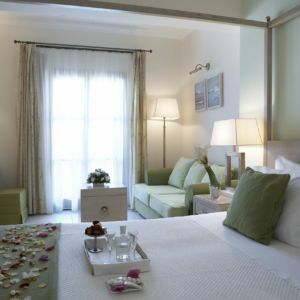 In elegant white and light blue hues, comfortable and spacious, it includes a majestic four-poster bed and a separate living-room area with sofas and dining room table, original works of art, antiques, espresso machine, a mini bar and an additional added Mini wine bar with a selection of refined Greek wines and vintage champagnes. The Ottoman Gardens Pool Suite can be combined with neighbouring Ottoman Gardens Junior Suites and another – Ottoman Gardens Pool Suite and create a 4 bedroom Suite with 2 Private Pools and 2 open-air Jacuzzi. The Lindian Village Spa is a key ingredient in helping to make this hotel in Rhodes a haven for total relaxation and rejuvenation. With an extensive treatment menu, wonderful products and exceptionally skilled therapists and personalized wellbeing programmes, this transcendental Spa in Rhodes has four treatment rooms for massage, body treatments and facials, plus an outdoor open-air pavilion for massages with an extended view of the ocean. This Rhodes Spa also boasts an indoor swimming pool with hydro jet massage, sauna, Turkish baths and a Jacuzzi for two, where you can relish in our Oriental water treatments. There’s nothing better than to leisurely enjoy a swim at Lindian Village’s private beach with its plush chaises lounges, water sports activities, and all day service from the Pool Bar. Peaceful, quiet and secluded, the glittering sea of the Lindian Village awaits you. The restaurant specialises in the blend of Mediterranean and refined International cuisine, superbly prepared and served with flair. The atmosphere is casual yet cosmopolitan. Experience authentic local cuisine at Basil, the beautiful gourmet Greek restaurant. Olive oil, vegetables, wild greens, legumes, fish and fruit are used to create dishes inspired by both mainland Greece and the Aegean Islands. Our Sommelier pairs each dish with a Greek wine mainly originating from small but exceptional producers. Feel Greece and taste refined local delicacies under the star glazed sky with complimentary views of the exuberant Aegean Sea. If romance is on the agenda, head to the al fresco Astroscopus with its commanding views of the Mediterranean. Feast on an extensive variety of seafood and enjoy the notes of wines from the restaurant’s cellar or even more indulge in our champagne selection. A touch of the orient in vibrant red colours, a harmonious blend of eastern spices and herbs, signature dishes and exotic cocktails “From Thailand with Love”.